From any screen, summon the Charms bar by sliding your finger inward from the screen’s right edge. When the Charms bar appears along the screen’s right edge, look at the dark rectangle that appears near the screen’s bottom left. 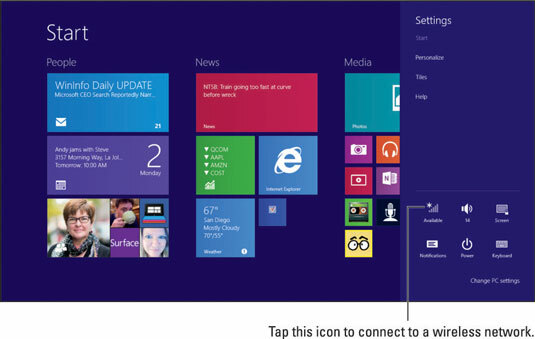 A glance at the icon in the rectangle’s upper-left corner shows when you’re within range of a wireless network. If you’re within range, move to Step 2. Not within range? Move to another spot, probably the place where clusters of people huddle over their tablets and laptops. Tap the Charms bar’s Settings icon. 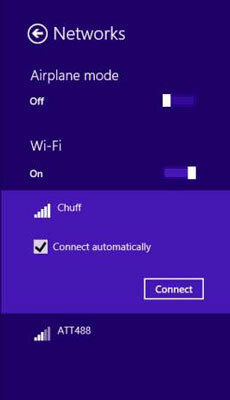 When the Settings pane appears, tap the Network icon. The bottom of the Settings pane shows six icons. 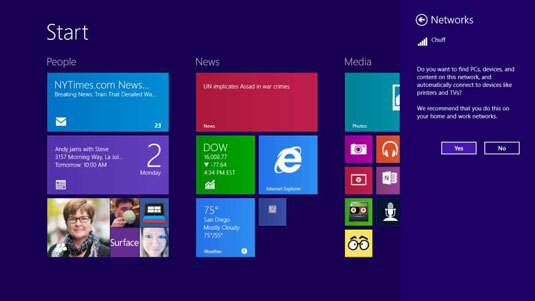 The icon in the top left represents networks. 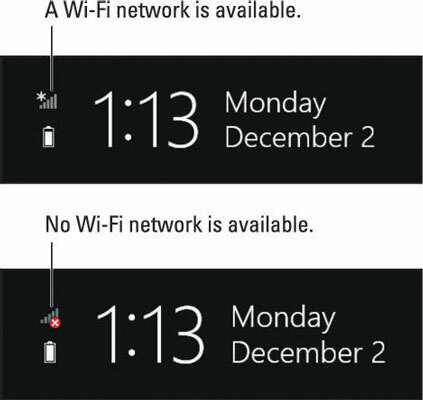 The icon toggles between Available and Unavailable depending on whether you’re currently within range of a wireless network. Available: When the icon says Available (shown in the margin), you’re within range of a wireless network. Move to Step 3 to begin connecting. Unavailable: When the icon says Unavailable (shown in the margin), you’re out of range and out of luck. (Wi-Fi signals rarely reach more than 300 feet from their transmitter.) Try moving to a different location or ask somebody whether a Wi-Fi signal is available. Then return to Step 1. Tap the Available icon if it’s present. The Settings pane turns into the Networks pane, listing the names of all the wireless networks around you. Depending on your location, you may see several listed. Windows ranks the wireless networks by signal strength, placing the strongest (and usually closest) network atop the list. A wireless network’s name is known as its SSID (Service Set Identification). The SSID represents the name that you (or the network’s owner) chose when originally setting up the wireless network. Tap the name of the network you’d like to connect to and tap the Connect button that appears. If Windows connects to the network, you’ve finished: You’ve connected to an open network, meaning it’s unsecured and requires no password. Don’t do any shopping or banking on an unsecured network. Unscrupulous bystanders can snoop on your connection to discover your username and passwords as you sign into websites. If Windows asks you to enter a password, however, move to Step 5. Enter the password for the wireless network and tap the Next button. 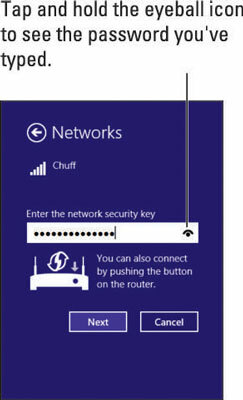 If Windows asks you to Enter the Network Security Key when you tap the Connect button, you’re trying to connect with a secured, or password-protected, network. So, you must type the network’s password. If you’re connecting to somebody else’s wireless network, you need to ask the network’s owner for the password (or whisper What’s the Wi-Fi password? to the person next to you at the coffee shop). If asked, choose whether you want to share your Surface’s files on the network and search for other networked devices such as PCs, TVs, and printers. Yes: If you’re in a private setting, such as your home or office, tap Yes. That lets you connect with networked printers and swap files with other people on the network. No: If you’re in a public place, such as a hotel or coffee shop, tap No because you don’t want strangers to access your files. That lets you access the Internet but keeps other people on the network away from your files. 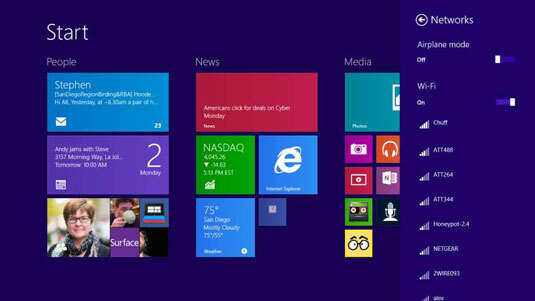 When you finish the steps, Windows connects to the network, and your Internet connection begins flowing into your Surface.